Upscale Hawaiian cuisine. Open for breakfast, lunch, and dinner. 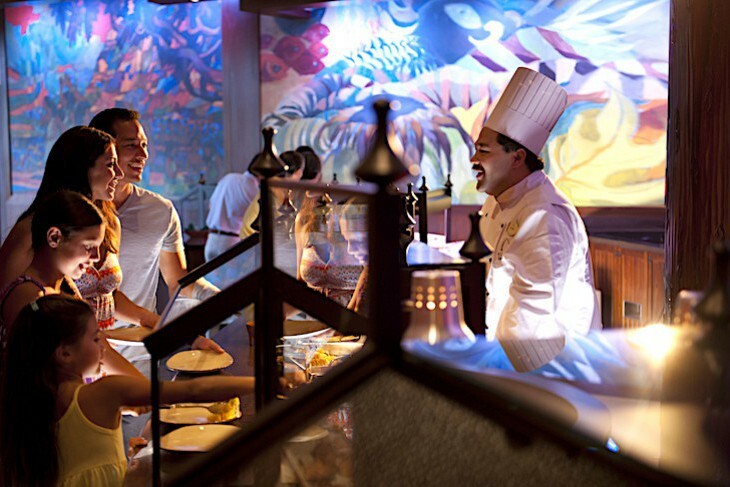 Aulani’s premier beachside restaurant consists of three open-air dining areas, each representing Uncle’s fishing shack in various stages of add-ons. Ocean breezes and sunsets views are at a premium, so plan to arrive in time to enjoy the sun sinking into the sea with music from Off the Hook next-door adding to the ambience. Inventive entrées prepared from local and sustainable ingredients as well as safe, standard fare make up ‘Ama‘Ama’s menu. A crispy Singaporean pepper shrimp appetizer lightly coated with panko served over sweet-sour Thai ketchup and accompanied by crisp, green papaya and a scattering of cherry tomatoes and sweet peppers is tasty if not fantastic. An even better choice is the Maui onion au gratin soup with sweet onions cutting the richness of the broth, thick with a golden brown cheese crust. Or sample the ahi tuna poke, traditional in Hawaii, marinated in soy and sesame oil and served with rice chips for scooping and a lovely avocado mousse. A fresh seared amberjack entrée on a bed of corn and artichoke scattered with chunks of fricasseed lobster is somewhat overwhelmed by a rich white wine lemongrass sauce. Perhaps the restaurant’s best entrée is the fiery seafood Thai curry abundant with mahi mahi, scallops, shrimp, and bok choy presented tableside and served with jasmine rice. I’m told that this extra touch of spice is not the norm, but I think it certainly jazzed up the dish. The Kurobuta pork chop might feel neglected so overwhelming delicious is its accompanying mascarpone white polenta, but its pink center and the rich sauce of Hamakua mushroom ragout, pancetta, cipollini onion, and confit tomatoes are near perfection. You won’t feel much like dessert after this baby is finished. If you're in a healthful mood skip ‘Ama‘Ama’s vegetarian entrée of house-made cavatelli spiked with sugar snap peas and zucchini, olive oil, and lemon-herb puree topped with a handful of watercress. Loaded with oil and a pesto-like sauce overpowered with garlic (an ingredient that wasn’t even mentioned in the entrée description) it is probably the most calorie-laden entrée on the menu. Instead, think about ordering the daily sustainable fish or one of the tempting appetizers … maybe the ceviche of shrimp, crab, and oysters, or a roasted tomato soup with a mini truffled Brie cheese Portuguese sweet bread sandwich? Way too many choices! Perhaps for the next time I happen to stop by the Hawaiian Islands. Hawaiian regional and global buffet. Open for breakfast and dinner. 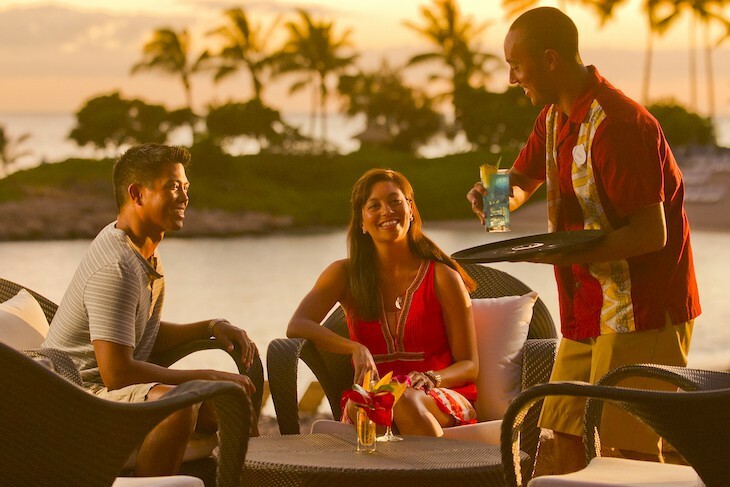 Know for tasty and plentiful buffet meals, Makahiki should be on your Aulani agenda at least once during your stay. Breakfast is a popular character buffet with Minnie, Mickey, and Goofy in attendance along with fun play for the kids. Don’t miss the French toast with coconut syrup or the traditional Hawaiian breakfast, loco moco! For dinner, massive buffet feasts with a variety of global food reflect the essence of the Islands as the restaurant’s ambience changes, along with the setting sun, with lighting turning from rose to indigo. And on Sunday, Monday and Thursday evenings join Aulani's beloved "Uncle" and some favorite Disney Characters for a musical song and story revue. Quick-service restaurant located in the Waikolohe pool area. Open 11 a.m.-5 p.m.
Self-serve restaurant for breakfast, lunch and dinner with views of the pool and the ocean in the distance from its outdoor terrace. Open 6:30 a.m. to 8:30 p.m.
Stay in your swimwear and have meals and snacks delivered to you at either the pool or beach area.